This vehicle is best used as a support tank and not as a "brawler". Flanking is where this tank succeeds, using its speed and manoeuvrability to get to the rear or sides of the enemy. Another good tactic is to shoot-and-scoot to maximize the maneuverability and gun over an opponent. 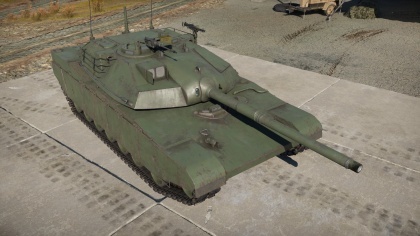 T-64B(V): Aim for the drivers hatch if you facing it frontally. If possible, get around its side and hit in dead under the turret, you will blow up its ammo racks this way. Leopard 2K: The Leo 2K is extremely potent against XM-1's seeing as their speed and mobility is similar but the Leo has a better gun. Your best bet is to flank the Leo and hit it in the side and or engine. Otherwise try to hide. Leopard 2A4/Type 90: Unless you get around to its side, there is very little you can do to kill this beast. It started in the early 1970s, at the height of the Cold War and the arms race. After the joint German-American project to create the MBT-70 main battle tank was closed, and the new all-American XM803 project was deemed an insufficient and too expensive response to the newest Soviet developments, the US Department of Defense developed a new list of requirements for the future American main battle tank. Two engineering giants joined the contest: the Chrysler and General Motors companies. Both contestants decided to use the developments for the MBT-70 and XM803 to design a new tank. Many corrections and additions were made to the tactical and technical requirements of the American government, first and foremost, on the defensive characteristics of the future main battle tank. The requirements for the tank’s armor and survivability increased, along with its maintainability in the field. In addition, the Arab-Israeli conflict showed that a modern tank must have the ability to effectively destroy armored targets at long distances, including with kinetic shells, and also have a sufficiently large complement of shells. In spite of the changes and additions to the technical specification, the contestants managed to achieve their goals, and by 1976, they presented their developments, the experimental prototypes of the XM-1 tank, for testing. Both vehicles were outwardly very similar, with practically identical dimensions. They were alike in their layouts and used the same 105 mm M68 rifled cannon. Both tanks turned out very well. Which prototype did the military choose, and why? The XM-1 (GM), the contest model from General Motors, became a further development of ideas and technological solutions for the MBT-70 and XM803 projects, including the diesel powertrain and mixed undercarriage with six roller wheels per side, three with hydraulic suspension and three with torsion bar suspension. The competitor to General Motors, the Chrysler company, used their XM-1 (C) model to present not only a progressive gas-turbine engine, but also a new undercarriage with seven independent roller wheels on each side with individual torsion bar suspension. In addition, the Chrysler engineers were able to save funds on constructing the tank by optimizing the components of the aiming equipment and the gun stabilization system. These details played a decisive role in the selection of the contractor to make the XM-1 project a reality. In spite of the fact that numerous flaws and “teething problems” arose during the project, the prototype for the USA’s next-generation main battle tank was confirmed. 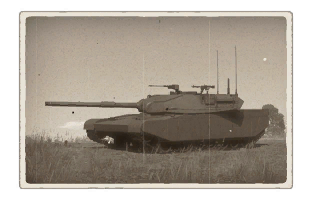 After several cycles of correcting issues and modernizing the prototype XM-1 (C), the first vehicles began to be deployed under the designation M1 Abrams. 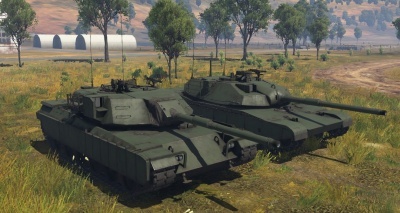 Comparison between a XM-1 (GM) and a XM-1 (Chrysler), side by side. This page was last edited on 20 February 2019, at 18:03.